Derry City FC has announced that a new batch of season tickets will go on sale ahead of the next home game against Dundalk. 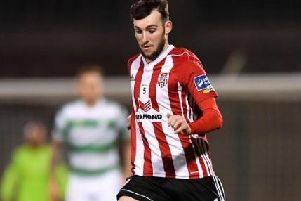 A spokesperson for the club said that the initiative had come about as a result of growing demand for tickets for the Mark Farren stand in particular since the season began. "Seats in the Mark Farren stand have been proving very popular so far and between existing season ticket holders, sponsors, guests and media, there aren't many seats left for general sale." "The club is taking this step to offer supporters their chance of guaranteeing prime seating in both the Farren and Southend Park stands for the upcoming Dundalk game and indeed for all remaining home matches throughout the season." "There is a really positive feel around the club at present and it is something that we all want to build on." "The new tickets will be priced to take account of the fact that there have been a couple of matches already played. We would encourage anyone interested to contact the club office as soon as possible as numbers are obviously limited." "Supporters can pay a small deposit which will guarantee their ticket and ensure that they don't miss out on what will hopefully continue to be an exciting time for Derry City."